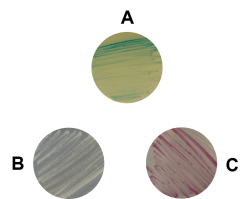 Figure 1: Three color stages of the EV. All agar plates shown contain X-Gal and IPTG. A The EV without any inserts. B The EV with an inserted Signal Peptide and gene of interest. C The EV with RPFsyn2 and an inserted gene of interest. As stated on the main page of this part, we aimed for an easy cloning and screening procedure in our cloning host Escherichia coli. To accomplish that, we chose to set the construct RFPsyn2 as placeholder for the N-terminally fused protein and the gene lacZα for the C-terminally fused protein, respectively. Therefore, the blue color of lacZα carrying colonies and thereby X-Gal degrading colonies masks the red color of the RFPsyn2 on X-Gal containing agar plates (Figure 1, A). However, on not X-Gal containing agar plates, the red color of the RFPsyn2 will be visible. This applies to colonies not carrying lacZα, too (Figure 1, B). E. coli colonies carrying neither lacZα nor RPFsyn2 will stay whitish as common E. coli colonies (Figure 1, C). By applying this setup, successfully transformed E. coli colonies can be identified easily. Following the amplification, we digested the PCR product with EcoRI and BsaI (resulting in an XbaI overhang) to maintain the BioBrick prefix in front of the promoter.followed by digestion with EcoRI and BsaI (resulting in an XbaI overhang) to maintain the BioBrick prefix in front of the promoter. Next, we had to create an entirely new multiple cloning site (MCS): We synthesized a new RFP based on the sequence of the RFP found in the pSB1C3 backbone. The expression of this RFPsyn2 is still driven by the IPTG inducible PlacI promoter but lacks any restriction enzyme sites interferring with the RFC25 standard. Additionally, we added an AgeI restriction enzyme site downstream of the RFP coding sequence which is necessary for translational fusions. Finally, we combined our new MCS, by ligating the digested RFPsyn2 (cut with XbaI and AgeI) with the lacZα fragment (cut with AgeI and PstI). This MCS was inserted into the pBS1C-PxylA backbone, which was prior opened using BsaI (resulting in an XbaI overhang) and PstI (Figure 2). Figure 2: Cloning scheme of the Evaluation Vector. The detailed cloning workflow which led to the finished Evaluation Vector construct with the pBS1C backbone. The final construct of our EV was then cut with EcoRI and PstI to be cloned into the pSB1C3 backbone and verified by sequencing prior to the submission to the partsregistry.